Whether you've been in a minor accident or a major collision, your car deserves the best service. Our state-of-the-art auto body facility utilizes the best technology to ensure the highest quality repairs. 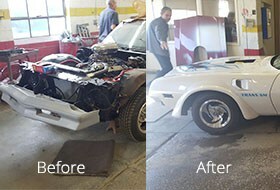 Our mission is to return your vehicle to its original condition. We offer free estimates for all auto repairs. Give us a call and let us look at the damage to your vehicle. Make sure you bring your car to us for a second opinion.